Funny thing I’ve learned the other day, which I want to share. 1. It’s Java based – it should be something with the app itself, right? No. 2. My app account doesn’t have required SQL permissions? Recheck. It has. 3. Then this is definitely a networking/firewall issue (it’s always the network)? Not this time. 4. I know - it must be the (mistyped) password!? Retype (several times), reset password – no luck. Next step in my troubleshoot (that actually gave some results) was to try to launch the SQL Server Management Studio with the user account that app uses to access SQL. So… I finally have an error (“Microsoft SQL Server, Error: 4064 – Cannot open user default database.”) which actually means something! It turns out that the login in question was having it’s Default database property set to blank. And it was blank because I’ve previously deleted the old database, without checking if it’s used somewhere… just to make sure the app installation creates a fresh one… silly me. No need to mention that app installation went just fine after taking care of this “thingy”. I love troubleshooting. So… you decided to finally configure backup for your servers, and just when you’ve chosen the “backup solution”, troubles start. What do we need for doing Windows Server backups? Let’s say that we have installed Windows Server Backup feature and chosen a network share for our backup location. The one other thing we need on this share are the right permissions for our service account (an account under which the backups will be done – for example, BackupAccount). We go back to our source server where we configure our backup schedule as a Full Computer backup, once a day, to the backup location previously mentioned, using the service account previously specified for this backup job. Everything goes fine. We’ve checked (and double-checked) everything – our share, permissions, Windows Firewall, and “who knows what”, and this wizard still says we cannot write to the backup destination! This must be an issue with the free, out-of-the-box backup solution. The issue here is that I’m running the Windows Server Backup console as “myself” (i.e. my user, for example, SERVER\tomica) and I don’t really have the required permissions on the backup share (I’m not a member of the local Administrators group on the backup destination and, as you may remember, only our BackupAccount has the required permissions set). So, is this an issue? No, not really because our scheduled backup will complete successfully (it will be running under the user account with correct permissions on a backup share). And, if we really want to make this first backup right now, we can run it from the Task Scheduler console (by checking the “Allow task to be run on demand” checkbox first, for the backup task). Hope this helps someone with similar problems (it’s kind of a dumb “issue”, but…). Well, you know the story – “something needs to be done immediately, usually in the middle of the night, involving PowerShell, and you don’t have all the needed modules installed…”. The solution seems easy enough – install the required modules, connect to Office 365 and do the job. Yeah… but no! 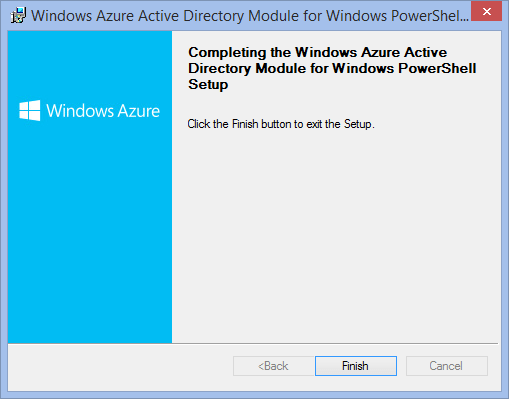 More specific – I’ve tried to install the Windows Azure Active Directory Module for Windows PowerShell the other night. In the end, I’ve succeeded, but something kept me awake a little longer than necessary. I’ve read an article on TechNet, explaining the management of Azure Active Directory using PowerShell. Why? Because I couldn’t do what was needed via the (nice) user interface. So, instructions said “Install the Windows Azure AD Module” – I’ve downloaded the appropriate installer (Windows Azure Active Directory Module for Windows PowerShell (64-bit version)), and started the installation. Almost immediately, I’ve got an error saying that the Microsoft Online Services Sign-In Assistant (version 7.0 or greater) needs to be already installed. OK, I’ve downloaded this piece of software as well (from here), and installed it. “Fortunately” it demands a machine reboot. Rebooted. So, it is installed after all. Maybe it’s the wrong version (on the other hand, the TechNet article contains the link to download)? After a few moments of searching, I’ve found the more recent version of this Sign-In Assistant, called Microsoft Online Services Sign-In Assistant for IT Professionals BETA. I’ve installed this version now, and tried to install the Windows Azure AD Module afterwards. Now it finally worked! The conclusion – this TechNet article is slightly out-of-date (linked to the wrong version of the Sign-In Assistant, which doesn’t work with the current version of Windows Azure AD Module) and, until this is resolved, you’ll need to install the BETA version from the link provided above (this one). After installing Visual Studio 2013 with Update 1 (or Update 2 RC; maybe also the RTM version – haven’t tried that one), you may be getting an error saying “The User Profile Service service failed the sign-in. User profile cannot be loaded.”, following an unsuccessful login. 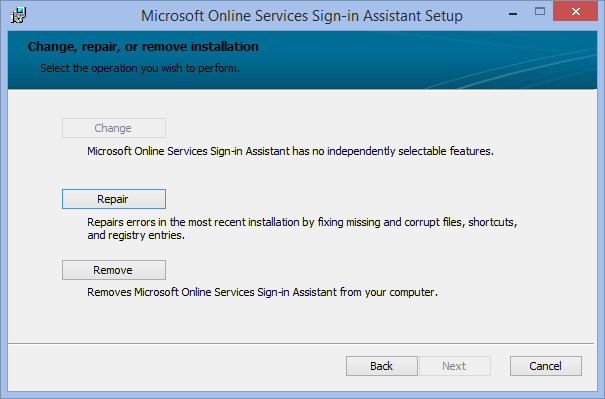 During Windows login, user gets an error saying “The User Profile Service service failed the sign-in. User profile cannot be loaded.”. After that, user is unable to login successfully. This was happening to users logging in for the first time (local of domain, doesn’t matter). Although I’ve seen this error mostly with Windows 8.1 clients, other versions may be getting the same error, because this seems to be Visual Studio issue. ), and then it worked – user logged in successfully. As far as I’ve observed – with Update 2 (clean install), this folder is empty (there are no .sqm files in it – I’m not really sure what was their purpose), so this issue shouldn’t be happening anymore. P.S. I’m strongly encouraging you to install Update 2.